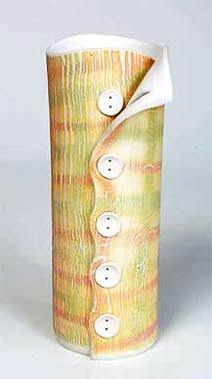 Jenny Finch button vase - 6½" (165 mm) high. 1991/2. This is hand-built in porcelain. Geoff and Jenny Finch set up the Dalton Pottery at Meikle Dyke, Dalton in Dumfriesshire, Scotland in 1989. Their work was originally hand-built, but when Jenny was pregnant in 1993 they moved over to slip-cast wares. They make domestic and decorative ware, models of cats and fishes and clocks. The decoration is hand-painted by Jenny. Visitors to the pottery can decorate their own pots, chosen from biscuit fired blanks, and enjoy a cup of coffee in the pottery café while the pot is being fired at low temperature for half an hour.